This is by far one of the best places we've stayed in Maui. The views were postcards and the place was located in a quiet, less populated place in paradise. In contrast when we snorkeled at Black Rock with the crowds, this place was a breath of fresh air. Marie, the innkeeper was extremely cordial. We would stay here again anytime. Everyone was friendly and our stay was perfect. Great kitchen and condo. Great to see a owner take pride in a rental unit ! You can see that love and care has been applied in this unit ! Great location and a beautiful unit 🐳?�🐟. Lots of whales , turtles and fish right out front . Thank you for a great stay . We have been staying at Makani Sands for more than 25 years. 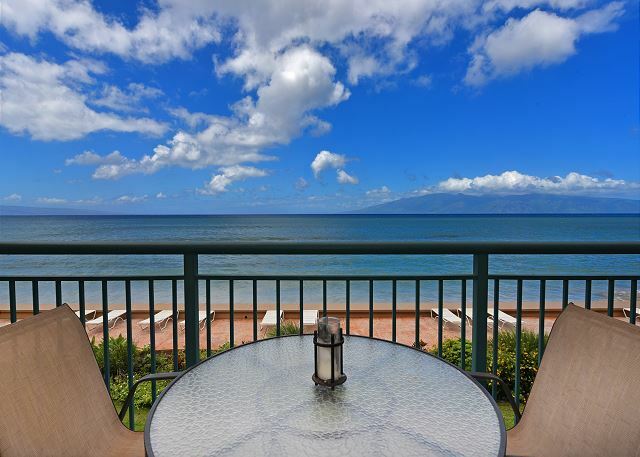 We love the view from our lanai, looking out at Molokai and Lanai. Great view for whale and turtle watching. We have met and made many long time friends at Makani Sands. We have stayed in many of the condos, but, enjoy 205 the most... We look forward to our next visit to Makani Sanda! The unit is very clean and nicely locate in front of the ocean. The property is also very close to gas stations, stores and restaurants. We are very happy during the stay at Makani Sands. We had a great stay for 3 weeks. Love the neighborhood with beaches to walk to,farmers market and coffee shop close by. There is great hiking nearby and you can even walk to dinner. Already booked for next year. Always a good stay at Makani Sands! This was our 25th year staying at Makani, we love the view and the condo that we almost always stay in (205). We have made some wonderful friends over the years and look forward to seeing them at the same time each year. Stayed in #205. WOW! Clean, Comfortable AND the view. They say location, location and Makani Sands is near everything. When staying in Maui we will only stay at Makani Sands #205.Thank you Marie you're awesome. Big Mahalo to Roseanna. Roseanna the gift basket you made was a huge delight for both my daughter and me. You guys rock! Highly recommend Makani Sands, the staff and property is awesome. We will definitely be back. Happiness is....7 days at Makini Sands beachfront condo. I have stayed Here 4 times each time in a different condo. I find everything I need from dishes to lawnchairs. You can walk out of your condo and into the ocean in less than 3 minutes. Everything is clean and if you need anything the staff is always cheerful and helpful. We felt completely at home while staying at Makani Sands. I first stayed at Makani Sands about 25 years ago, and thoroughly enjoyed my recent return. It is still a great place to stay on Maui. It has all the amenities you could need for a Hawaiian vacation and is a very friendly, relaxing place to be. It is also in a perfect location, with everything you might want closely at hand. Absolutely great experience. Wonderful people on site Roseanne,Marie and Bert. We have stayed at Makani Sands a couple of other times and it has always been amazing. The condo and grounds are and very well kept. Burt, Roseanna and staff are easy to work with. Didn't see much beach this year as it was high surf but it was fun to watch the surfers, whales and turtles from the lanai. Will be back as soon as possible. We have stayed at Makani Sands many times and have never been disdappointed. The condo had all the basics for cooking and was very clean. Marie is helpful and friendly and Bert keeps everything clean and tidy. The ocean view and sunsets were fantastic! The bbq is right near the beach. The beach and swimming are fine and we saw the turtles every day. The busy street can be noisy, bring ear plugs. We staid in Appartement 205. Everything was perfect. The entire experience was outstanding. No complaints. WONDERFUL STAY, WELL MAINTAINED,NICELY UPGRADED LANDSCAPING,ETC.DON'T LIKE PAYING OVER $200.00 A NIGHT AN HAVE TO BUY YOUR OWN TOILET PAPER,TISSUE ETC. Really enjoyed time there. Great location.Best Views. Everything was perfect! pictures do not do it justice. If I had to mention a "Con", it would be you can hear furniture movement from unit above. Luckily other unit was empty 3 nights out 4. 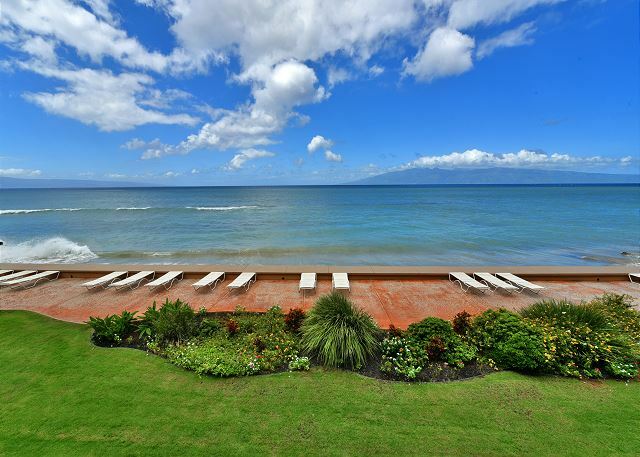 Makani Sands is a wonderful ocean front condo. we were unhappy with the unit we stayed in. Sleeper sofa was dated and could hardly be used. Unit was not stocked well, missing things like tin foil, spices many kitchen items etc. Overall we love Makani sands but would never stay in unit 205 again. Really liked our condo, clean and comfortable. If I had any complaint it would be that the sofabed could use a new mattress. Otherwise it was great. Kitchen was very well stocked with most anything you could need. The location was very convenient. This was one of the best vacations we have taking and thats something huge for a couple that travels a lot. I rated the overall stay a 4 stars because of the window in the bedroom. This window is open all the time and just covered with a screen and blind so you can hear everything and everyone can hear you. Being a couple in Maui for there 1 year Anniversary this was the only bad part of the trip. Location perfect: best view, everyday we saw whales, turles and people paddle boarding. Please make sure to do the Atlantic Submarine and travel the Road to Hana. The nice lady at the front office gave us a cd that help along the journey. Came to take it easy and did exactly that. Went on a whale excursion and saw what i expected to see and then some. The lanai had the best views. The bed was also amazing. Slept like a king. Would not change a thing and i will be back. Makani Sands and Maui: a matched set! We have been coming back to Makani Sands and have stayed in several units over the years. Love the view from the Lani where you can watch turtles, whales and sea-going creatures (people), enough beach to play on and the people are always so friendly. Unit 205 was wonderful and we will ask for it again in the future. Talk about an ocean view! The condo was perfect for us, Roseanna onsite was fabulous in the office, as was Bert, onsite for maintenance and overall helpfulness. The unit was clean and had everything we needed. Location so convenient! We loved it. The management and office staff are extremely helpful, friendly and professional. Bert does a great job of maintaining the property. The condos are stocked with everything and more that one would need. The location is divine. We rented 4 condos for our family and everyone had a fabulous time; we will definitely return.